Landscaping impacts motorists’ behavior by narrowing the optical width of the road and communicating a change in the character of the roadway from rural to urban. Landscaping (City of Springfield, Illinois). By planting alongside the road. The optical width of the road is narrowed as opposed to the physical width. A tunnel effect is then created and the drivers field of view is narrowed, which should encourage slower speeds. By communicating a change in the character of the roadway from rural to urban. 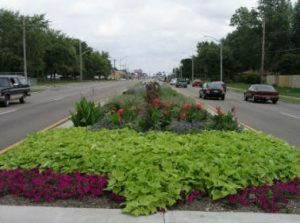 This is done by changing the nature of plantings alongside the roadway. For instance, in rural areas, trees are found in naturalistic clumps or groups while, in urban areas, trees are planted in formal rows and spaced at regular intervals. Landscaping can serve multiple purposes, such as community development, beautification, and traffic calming. The research literature is not clear on whether landscaping alone will be sufficiently effective to calm traffic in the absence of other traffic-calming treatments (i.e., physical treatments and enforcement). Lakewood, Colorado used a series of landscaped medians and curbside islands to create a narrow serpentine roadway alignment for traffic calming on a collector street. The alignment was 1,150 feet. Due to concerns that traffic would be diverted to other residential streets, the goal was to reduce speed but not volume (Buchholz et al. 2000). No statistically significant difference in crashes occurred, however, only a very short after-analysis period was used. No crash modification factors (CMFs) were found relating to landscaping. slow speeds and maintain traffic flow along an arterial roadway. Buchholz, Karl, David Baskett, and Laura Anderson. Collector Street Traffic Calming: A Comprehensive Before-After Study. Presented at annual meeting of the Institute of Transportation Engineers, 2000.